A loose leaf tea infuser is any type of device where you place loose tea leaves inside, which is then steeped in hot water to make tea. It essentially performs the same function as a tea bag except you use high quality loose leaves, instead of the broken down bits contained in tea bags. Tea infusers are often shaped like an egg and have a mesh container, so that the leaves themselves do not enter the actual water. There are usually two halves which close together, and sometimes a chain is attached to pull the infuser from the water. With infusers, you still need to make sure that you brew the tea at the proper temperature and steeping time, as recommended by the seller. Nowadays, loose leaf tea infusers come in many modern styles and designs. There are infusers shaped like flowers, animals, people, robots and more, in addition to various colored versions. There are also your traditional metal looking infusers. Tea infusers are normally dirt cheap ranging from $1-$25, depending on how fancy you want to go. As far as size, there are many types ranging from the smaller kinds suitable for one cup of tea, to the larger infusers that can allow you to brew an entire teapot. You can buy infusers almost anywhere either online or in retail stores. Bed Bath & Beyond sells a number of nice ones, along with all of the popular tea shops. Amazon.com also has a wide range of infusers in many shapes. Infusers can be a great accessory if you want to make tea blends with other types of teas or herbs, so you’re no longer be limited to what is in tea bags. They also make great gifts for a tea lover. In the first half of the 19th century, loose leaf tea infusers really took off in popularity. At the time, many were made from silver, so they also served as an ornament along with a utensil. Nowadays, there are a number of different ways to brew tea, but using infusers is still a popular method. Loose leaf tea infusers can go by many different names such as tea ball, tea maker, or tea egg. 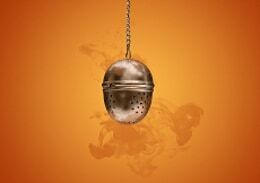 “Tea infuser” and “tea ball” are often used interchangeably, but the term “infuser” covers a wider range of designs. The infusers of today can actually float on the hot water or be placed deeply within the hot water. They even have spring action handles, which make steeping a cup of tea very simple. When using tea infusers, you do not want to pack it too tightly with leaves. The reason is that the tea leaves expand while you steep them in the water and release their various flavors and health benefits. Many people recommend filling tea infusers half full, at most, to allow for this full expansion of the leaves. Some tea connoisseurs are against infusers and prefer brewing tea leaves in the water itself for full expansion, then straining out the leaves. Hopefully, you now have a better understanding of loose leaf tea infusers.